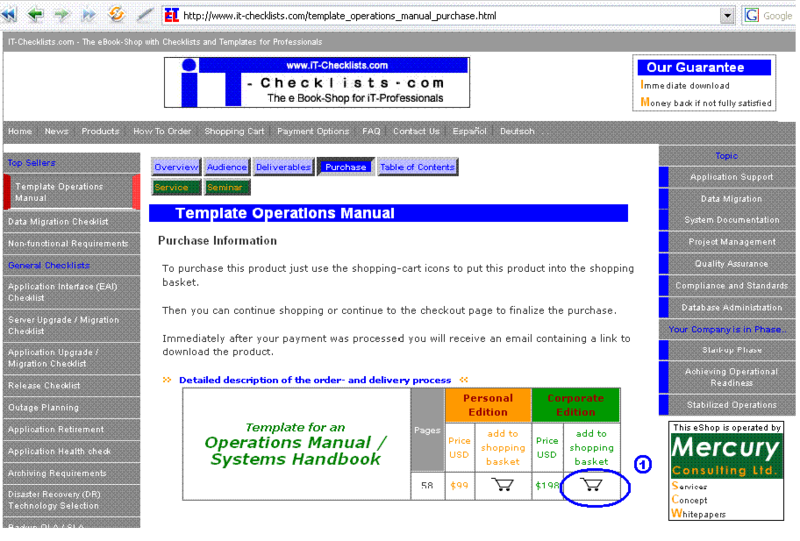 The order- and delivery process has 6 steps, in step 6 you download the product. 2. Review your Order and Click "Order Now" to continue to the checkout page. If you did select "Credit Card" Payment, then you are re-directed to an SSL-encrypted session to WorldPay, the payment processor. This company belongs to the "Royal Bank of Scotland Group", one of Europe's largest banks. Again you have to fill in your name, address and the credit card number - but we NEVER see that - you transfer that SSL-encrypted direct to WorldPay. We just get from WoldPay an confirmation that your Payment was accepted or declined. (5c) - The "RBS WorldPay Transaction ID" is the reference number for your payment. one email from us containing the link to immediately download the product. If you receive our email already before the email from WorldPay, then the download link will be active only AFTER you received the payment confirmation from Worldpay. Clicking on the download-link of our email you can download the product! 7. If you are not satisfied with our product, than notfiy us using our response-form and confirm that you deleted all copies. We will refund your payment within 14 working days.